The initial Indian group was composed of Guale Indians from Georgia. Tolomato was the name of a place, possibly a river, where they lived. They were brought to St Augustine in the 16th century after attacks from hostile tribes and moved to the site of the current cemetery during the attacks by British forces from South Carolina and Georgia that destroyed the Florida missions in the early 1700s. When the British took over St Augustine as a result of the treaty ending the French and Indian (or Seven Years) War, most of the Spanish citizens left and went to Cuba or on to other parts of the Spanish Empire. Spain returned to Florida in 1784, after the settlement of the American Revolution, which expelled England from North America. But during that 20 year period, a group of immigrants, the Menorcans, had arrived in town. They are the ancestors of many St Augustine residents, brought here from the Mediterranean by Dr. Turnbull, a Scottish doctor and British colonist, as indentured servants to work on an indigo plantation in New Smryna Beach. Badly treated, they rebelled after a number of years and came to St Augustine in 1777, along with their priest, Fr. Pedro Camps. Fr. Camps asked the British Governor, Gov. Patrick Tonyn, for permission to bury deceased members his parish in the "old Catholic cemetery" of Tolomato, and the governor agreed. While there are possibly Indian burials there, this was the beginning of the use of Tolomato solely as a cemetery. There are large numbers of documented burials from the 18th and 19th centuries, with all burials ceasing in 1884, when all cemeteries within the city limits were closed by the city government because of fears that they assisted in the spread of yellow fever. Cemeteries had little to do with it, but nobody knew that until 1905, with the work of Dr. Walter Reed in identifying the mosquito as the vector. The cemetery is the resting place of people from all the diverse groups that created St. Augustine, and includes Spanish, Minorcan, Irish, African, Greek, Italian and 19th century Southern and Northeastern American burials. Also buried in Tolomato Cemetery are many individuals important to the history of Florida. A Florida Franciscan Mission, Hugo Ohlms, Cathedral Basilica Mural. Minorcans entering the City Gates. Hugo Ohlms, Cathedral Basilica Mural. 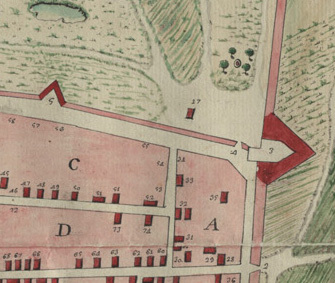 1763 Map, showing the "Ermita de Piedra," the now vanished stone chapel at Tolomato. 19th Century Grave Enclosure of Maria Hernandez and Family. Tomb of Fr. Miguel O'Reilly, died 1812.